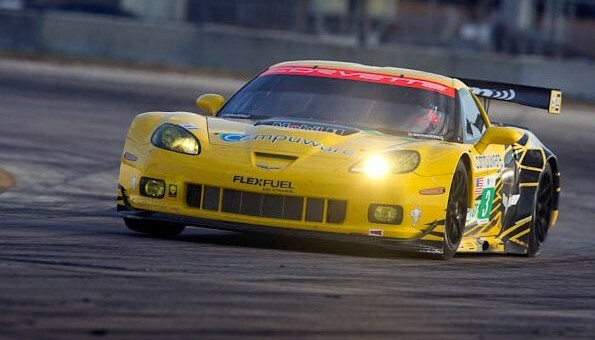 You may not have noticed, but Corvette Racing was busy during the past couple months fine-tuning its latest version of the C6.R. A wider, broader, better C6.R. And it will make its racing debut this Sunday at the start of the 12 Hours of Sebring. Specifically, the new body style stands at 80.6 inches wide — 2 inches wider than last year’s setup that saw the only season victory during the 24 Hours of Le Mans. But this is much more than a wide body kit, as the C6.R race cars had to be fitted with new Michelin racing tires optimized for the wide stance. Additionally, the suspension system had to be completely recalibrated to better help the cars hug the track and maintain grip through corners at speed. As for other modifications, the rear wing is mounted 75mm higher than last year, and the front fascia now bristles with dive plane “whiskers” to enhance front downforce as the 5.5-liter Chevrolet small-block V-8 breathes through twin 29.2mm intake air restrictors (.4mm larger than in 2011) as specified by the GT regulations. We’ve provided the full spec sheet just below, along with the presser. So, who’s putting their Sunday after St. Patrick’s Day aside to watch all of the ALMS action? Next story Should GM Offer A Diesel Sonic In North America?